I really need to do some serious stamp shopping! I am wanting to make Valentine's card right now but I'm really lacking in the stamp department. 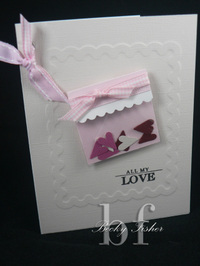 I did, however, place an order with Stamping Bella last night. I'm a LONG ways from Canada so I'll have to be patient! Anyhoo, this is what I came up with using my limited supplies. The cardstock is Vanilla Bazzill embossed with my Nestabilities. The little envelope is a 2 x 2 clear envelope that came in a package of 65 from Michael's. I filled it with little punched hearts in various Bazzill colors, and the sentiment is from . . . actually, let me get with on that one. It's a clear set that I bought from Archiver's last year and I can't remember the name. On the envelope, I used a little piece of foam tape between the bag and the cardstock insert . This helps the little hearts move around in the bag a little. Well, I think I might cruise on over to Paper Trey Inc. since I'm on a stamp purchasing mission!